The Pound rises, shrugging off a disappointment in October’s UK Services PMI figure as investors bet on a positive Brexit deal outcome. Yesterday’s services PMI figure for the UK printed at 52.2, beneath market consensus of 53.4, and down from September’s 53.9 number. This slowdown in the British services sector is usually met with a sell off in the Pound, however, this time it was different as traders felt optimistic about striking a soft Brexit deal. Investors are feeling optimistic due to a Sunday Times report suggesting that Prime Minister Theresa May has reached a Brexit deal with the EU in which the UK will remain in the EU’s customs union and there will be no hard border on the Irish island. In addition to any Brexit developments, traders need to also monitor the outcome of the midterm congressional elections from the US as the result will impact the Pound from the greenback’s side. As positive sentiment surrounding Brexit remains intact, the Pound is expected to continue its rise. A second bullish leg was triggered yesterday by the break above the 1.2990 resistance which opens the way for a rise towards the next significant resistance level at 1.3110. 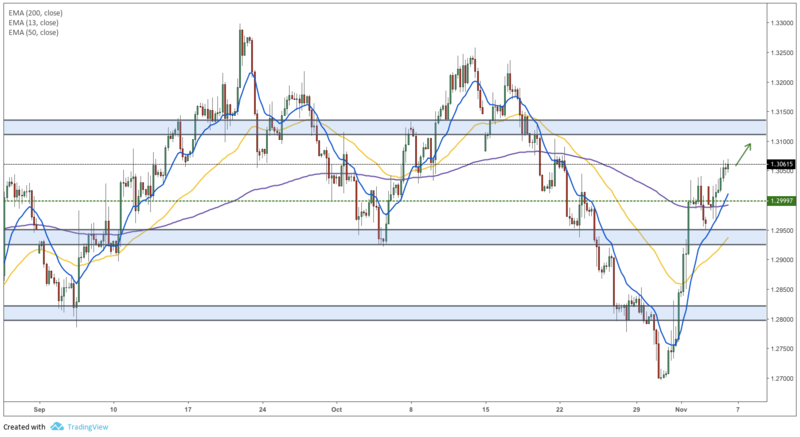 The break above the 1.2990 resistance was important since it confirmed a break of the 200-period moving average which represents a shift in the general trend of the pair, from bearish to bullish.